Photo courtesy of City of Irving, Texas. The City of Irving, located between Dallas and Fort Worth, is the 13th most populous city in Texas and the 94th in the United States. The city, home to approximately 217,700 residents, encompasses an area of 68 square miles, including Dallas-Fort Worth International Airport. Core services provided include law enforcement and compliance, fire protection and emergency medical, water and sewer, refuse collection, street maintenance and traffic management, parks, libraries, recreational and cultural programming, and capital improvements. The City of Irving is one of five cities in the state and 89 in the nation with a AAA rating from both Standard and Poor’s (S&P) and Moody’s—ratings that it has maintained since 2007 and during the worst recession in U.S. history. Irving’s 2012 employee survey results show that its employee ratings exceed the highest comparable score received by a U.S. government agency. For example, 95 percent of Irving employees say the city government is a good place to work compared to a federal agency high of 84 percent. Since 2006, the percentage of residents rating many of the city’s key services—including police, code enforcement, libraries, and recreational—as good or excellent has increased by double digits. 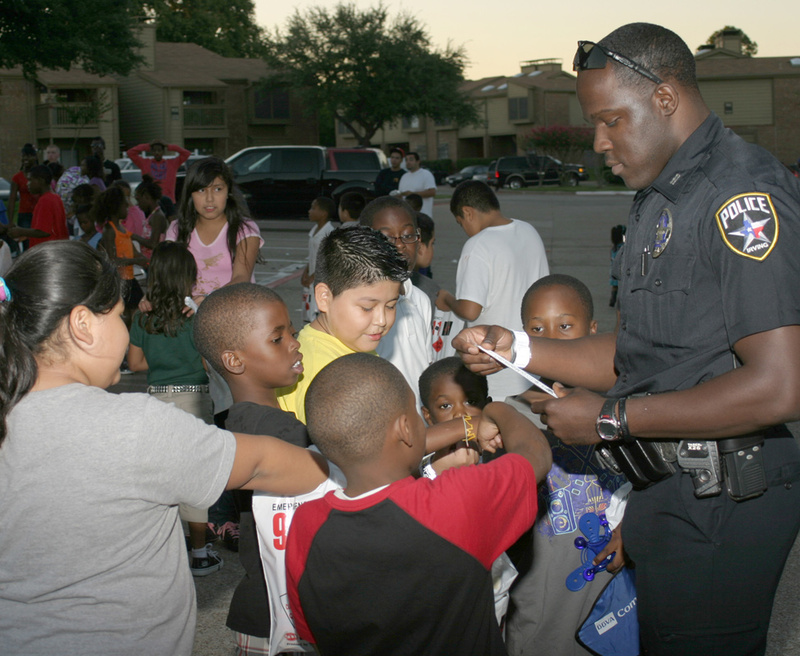 Irving’s police utilize best practices such as community policing, a problem-solving team, Twitter-based community crime watch groups, and increased use of volunteers. Violent crime decreased from approximately 700 incidents in 2007 to 500 in 2011. Overall violent crime per 1,000 persons decreased 35.5 percent from 2006 to 2011. This decrease compared favorably to neighboring cities, one of which saw an 8.6 percent increase for the same time period. The City of Irving one of five cities in the state and 89 in the nation with a AAA rating from both Standard and Poor’s (S&P) and Moody’s—ratings that it has maintained since 2007. Irving’s tax rate is the second lowest in the Dallas-Fort Worth Metropolitan area. Since 2007, its overall cost of service—combining property tax, water, sewer, drainage, and sanitation charges—has been better than four comparable cities in the area. Property tax revenues, more than 70 percent of which are from commercial property, are approaching $100 million. This far exceeds two comparable area cities with revenues of about $75 million. Fiscal accountability in Irving is based on a system of financial reporting audits plus internal and external audits. External audit results, findings of bond rating agencies, and City Council agenda packets and minutes are easily accessible online, part of the reason that the city has, since 2010, exceeded nine comparable cities in the area of financial transparency as recognized by the State Comptroller’s office. External audits have not identified any material weaknesses or repeat findings since 2008. Each year, Irving mails a resident survey to randomly selected households across the city, as well as making it available online. Survey results are posted on the city’s website and published in the city newsletter. Additionally, Irving administers more than 30 internal and external point-of-service surveys in various city departments to obtain customer feedback for continuous improvement in service delivery. The rating for overall quality of service in Irving (74 percent) is higher than the state of Texas (46 percent), county government (37 percent), and the U.S. government (38 percent). Since 2006, the percentage of residents rating many of the city’s key services—including police, code enforcement, libraries, and recreational—as good or excellent has increased by double digits. Surveys have shown that the percentage of citizens who feel that overall quality of life has improved has increased from 52 percent in 2006 to 71 percent in 2012. The number of complaints resolved at the time of the call has reached a world-class level, increasing from about 50 percent in 2009 to greater than 90 percent today. Three out of four residents say that they would recommend Irving as a place to live. Irving’s strong collaborative culture includes using 50 cross-functional teams for accomplishing work and strategic goals. In fact, cross training enabled the city to continue meeting the needs of its citizens even as positions were lost through attrition during the recent economic downturn. Irving has not had to initiate workforce reductions during this time. Irving’s 2012 employee survey results show that its employee ratings exceed the highest comparable score received by a U.S. government agency. For example, 85 percent of Irving employees are recognized for their work compared to a 70 percent top score for a federal agency; 97 percent of city staff say they “know exactly what is expected of them” compared to an 84 percent high federal mark; and 94 percent of employees working for Irving say teamwork is encouraged compared to a U.S. government benchmark score of 76 percent. Additionally, 81 percent of Irving employees say they have opportunities for growth and development compared to a federal high of 55 percent, and 95 percent of Irving employees say the city government is a good place to work compared to a federal agency high of 84 percent. City employees who participate in Irving’s incentive-driven “I Win” wellness program can earn monthly pay incentives ranging from $50 to $150 per month for one year based on their annual physical fitness and medical test scores. The program, which has been recognized by the American Heart Association, has helped the city address rising health care costs and helped employees reduce health care risks. The city has saved an estimated $1.5 million in medical claim costs annually and reduced its actuarial-determined retiree health insurance cost by $25 million over a 25-year period. Irving has a fully deployed Strategic Planning Process that is integrated with key customer requirements and includes input from residents, businesses, visitors, and employees. The 10-step process incorporates sharing of results and goals through multiple methods, including quarterly reports and presentations to the City Council and city management. Stakeholder involvement helps prevent potential blind spots while aligning the strategic plan with work functions and the city’s mission, values, and vision. Irving aligns its annual Strategic Planning Process with its budget process. Senior leaders identify resource-saving operational initiatives to off-set potential shortfalls; implement Lean Six Sigma (LSS) process enhancements; and use planning, reporting, training, and monitoring tools to provide an expected high level of service while managing risks. Irving’s focus on process efficiency has resulted in more than $44 million in cost savings and efficiencies since 2008. Key work processes are managed using the performance measurement system and improved using LSS process improvement methodology. This has reduced variation, eliminated waste, increased workforce productivity, and saved or avoided costs. For example, the city has significantly increased the number of commercial plans reviewed within six business days from 34 percent in 2008 to nearly 100 percent today. Irving’s police utilize best practices such as community policing, a problem-solving team, Twitter-based community crime watch groups, and increased use of volunteers. Violent crime has decreased from approximately 700 incidents in 2007 to 500 in 2011. Overall violent crime per 1,000 persons decreased 35.5 percent from 2006 to 2011. This decrease compared favorably to neighboring cities, one of which saw an 8.6 percent increase for the same time period. Property crime decreased from 9,000 incidents in 2007 to fewer than 7,000 in 2011. Surveys show that the percentage of residents rating the quality of daytime safety in their neighborhood good or excellent increased from 93 percent in 2006 to 96 percent in 2011. Similarly, the rating for evening safety increased from 64 percent in 2006 to 81 percent in 2011. Irving’s emergency responders currently arrive in less than five minutes 73 percent of the time, a 38 percent improvement since 2007. This is better than a comparable nearby city (50 percent) and the International City/County Management Association top quartile for cities over 100,000 (62 percent). Additionally, 86 percent of residents in 2012 rated the city’s ambulance service as excellent or good. Irving has established a Green Advisory Committee and an enterprise-level environmental policy that includes such measures as a chemical substitution program, the use of solar power, and the requirement that all new city facilities meet Leadership in Energy and Environmental Design (LEED) certification standards. Since 2008, Irving has increased its use of alternatively fueled vehicles from less than 50 percent to more than 60 percent, compared to about 10 percent for a nearby city. Greenhouse gas emissions from the city have decreased by 17 percent since 2007. Since 2008, energy consumption by the city government has decreased by 5 million kilowatt-hours and by almost 3,000 cubic feet of natural gas—a total savings of $11.1 million.